1. 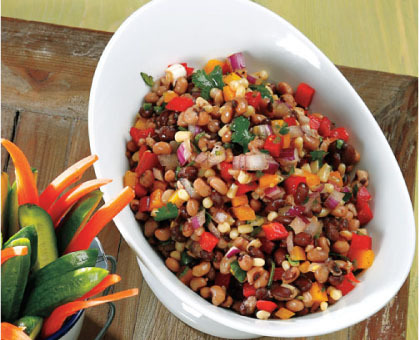 In large bowl, toss black-eyed peas, black beans, corn, garlic, bell peppers, jalapeño, onion and cilantro until well combined. 2.In medium bowl, whisk together vinegar, oil, salt and black pepper. 3.Pour vinegar mixture over black-eyed pea mixture and toss to combine. Cover and refrigerate at least 6 hours or up to 1 day. Toss just before serving. Serve with Tostitos® Tortilla Chips or as a side dish. Makes about 8 cups. > This recipe is a great way to incorporate beans… many Americans do not consume enough beans and do not realize that they are a good source of iron, protein and an excellent source of fiber. > Include the seeds and veins of the jalapeño chile pepper to add more heat to the mix.